PIPE INTO THE LIQUID FUTURE. By year 2030, years of cross-breeding and genetic modification by the corporate operative have left the vast farmlands barren with sterile GMO seeds that fail to produce any crops. The seeds saved from biodiversity era have gone underground, cultivated in hidden tiny plots by the RESISTANCE farmers. By year 2030, the GOVERNMENT pipes out synthetic liquid food for its ‘feed the public’ program as food scarcity calls for such urgent measures. Each adult citizen is entitled 1000ml liquid food bag per day for nourishment. The food DEPOTS, built like the old style gas stations, are set up for liquid refill. The smell labs invested by the future food consortium engage themselves in producing colorful liquid food. Bearing names of old farm produces (i.e. apple, beans, carrots, dikons etc. ), the liquid food strives for the ‘real taste’ of old varieties. 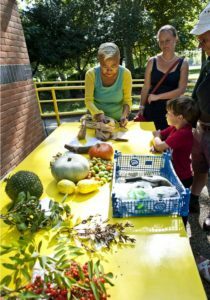 Rise up are troupes of RESISTANCE farmers who search the old time produce and recipes to re-create the smell of home cooking. They build themselves ultra mobile kitchens as their cooking has gone underground in opposition to the GOVERNMENT’s pipelined food supply. Cooking and moving along secret alleyways, they bring back the smell of real food and the joy of communal eating. The food conscious citizens chase the smell of home cooking. Gather around the mobile kitchens on the move, they share meal time with tales of cooking and eating, reminiscent of a long gone past.